Chief Minister P.K. Dhumal today said the MC inquiry report regarding the alleged unauthorised construction of the new Congress Office here was still awaited. The government would treat it like any other case, he said. The Himachal Pradesh Cabinet today approved signing of the Pre-Implementation Agreement (PIA) in respect of Chango-Yangthang (140-MW) and Bara Banghal (200-MW) hydro electric projects for execution by private entrepreneurs. While the state government maintains that the policy of allotting hydroelectric projects on the basis of upfront premium was the best option, a comparison with the bidding process adopted by other states indicates that it has been a losing proposition. The once-rich Tibetan culture and heritage has been reduced to a shambles in its native land and Tibetans were living in extreme fear under the shadow of gun-totting Chinese Army. The Tibetan government in exile strongly refuted the charges of accusation that the Tibetan temporal head and spiritual leader Dalai Lama and Department of Security of Central Tibetan Administration (CTA) for stirring up violence and demonstrations in Tibet. Absence of an anaesthetist has virtually brought functioning of the 100-bed Civil Hospital, Nurpur, to a standstill for the past many years. The skilled surgeons have been prescribing medicines and referring the serious cases to other hospitals as they have no patients to operate upon in the absence of an anaesthetist. Latest research done in the treatment of diabetic foot with the help of angiopathy or by-pass surgery could lead to near elimination of amputation, commonly suffered by patients of acute diabetes. Farmers of the area were shocked over the failure of wheat crop for the want of sufficient rainfall this time. The crop had virtually wiped out from the fields in most of the rain-fed area. Even in some pockets, the farmers were facing problems in meeting the demand of grass for cattle. A constitutional crisis has arisen in the local Baghat Urban Co-operative Bank here with the government de-notifying the two nominated members from the Board of Directors (BoD). It has reduced it to a mere strength of three. Chief Minister Prem Kumar Dhumal has reiterated the resolve of his government to uplift the status of minorities in the state and to provide them ample opportunities in every sphere. 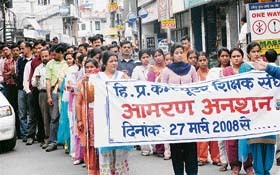 The Himachal Pradesh Computer Teachers Association today took out a candlelight procession in the local market in protest the picking up of five teachers on an indefinite fast by the police on Saturday night. Hundreds of teachers joined this protest march. Gang rivalry seems to be the reason behind the murder of 27-year-old gangster Rajeev, a resident of Kathua in Jammu and Kashmir, whose body was found on the Kufri-Chail road, near Mundaghat, yesterday. A Kasauli court today remanded seven members of a gang of motorcycle lifter in police custody till April 4. They were arrested while trying to flee after lifting four motorcycles yesterday. They had also broken the locks of a shop at Garkhal and stolen Rs 1,200. The Himachal Pradesh Petroleum Dealers Association has urged the state government to move fast and block the decision of the Indian Oil Corporation (IOL) to wind up its Damtal depot of petroleum products from April 1, which would cause incalculable difficulties to Kangra and Chamba districts where all these products are supplied from this depot. Former transport and tourism minister and sitting Nagrota Bagwan Congress MLA G.S. Bali has expressed reservations over the claims of former Chief Minister Virbhadra Singh for the defeat of the party in recent assembly poll. The state government effected a minor administrative reshuffle today. Bhuvneshveri Vohra, AC (leave reserve) to DC, Chamba, has been given the additional charge of AC to DC, Chamba. Rakesh Kapoor, AC (leave reserve) to DC, Shimla, has been given the additional charge of AC to DC, Bilaspur. Food and civil supplies minister Ramesh Dhawala today conducted a surprise inspection of two medicine shops of the state food and civil supplies corporation in the local Indira Gandhi Medical College Complex and one shop in the Kamla Nehru Hospital Complex. The tourism industry in neighbouring areas of Punjab and lower areas of Kangra and Chamba districts has received a setback due to the termination of Delhi-Pathankot daily air service by Air Deccan from Saturday. Sunny Sharma, a student of B.A final and resident of Spain village of Jawali subdivision of this district, died under mysterious circumstances in the Depot Bazar, Dharamsala, today morning were he was residing in a rented accommodation. Two persons died in two separate accidents both were riding the bikes and collided with trucks. Cases have been registered against the drivers and vehicles impounded. The first accident occurred yesterday night near Kanaid at 9 pm when a speeding truck (HP-31A-0234) collided with the bike. Three youths were killed when their car rolled into a khad near the Housing Board Colony at Panthaghatti last night. The mishap took place around 10 p.m when Indica car (HP-01-0394) fell into the khad. The Additional Sessions Judge Chirag Bhanu Singh today sentenced Amarjeet Singh and Karamjeet Singh, residents of Jhira village in Nalagarh subdivision, to life imprisonment for murdering their parents in August, 2006. The HP State Electricity Board (HPSEB) employees staged dharna in protest against the proposed trifurcation of the board here today. They were demanding immediate scraping of the trifurcation proposal. He was replying to a query by Rikhi Ram Kaundal of the BJP regarding the construction of Congress Office. “The land leased to the Congress for constructing its office was 759.2 sq m while the building has been raised on 2611.12 sq m, with two additional floors than the one approved by MC,” he said. He said an NOC had also not been obtained from the National Highway Authority. He said the matter was referred to the inquiry committee of the MC on December 4, 2007, and the report was still awaited. “The MC commissioner is authorised to regularise up to 10 per cent of unauthorised construction, but the deviation is too much in this case and a final decision is still pending,” he said. He assured members that the case would be treated on merit without any bias. He, however, pointed out that being a sliding zone, the previous BJP regime had rejected the request by both the Hamirpur Sabha and the Congress as it had been proposed to shift Subzi Mandi to this site. “The land lease is valid and all dues cleared, but more land has been encroached and the two extra floors raised,” he said. Former Chief Minister Virbhadra Singh requested that the necessary permission may be granted by the government as two extra floors had to be added to stabilise the structure. Moreover, the top floor had been beautified so that it synchronised with the architectural design of the nearby high court building. CLP leader Vidya Stokes said the two additional floors had to be raised to give extra height and stability to the building and keeping this in view, the government should grant permission for deviation sought by the Congress. In reply to another question by Mohinder Singh of the BJP, IPH minister Ravinder Ravi assured the House that action would be taken against all those found guilty in the alleged irregularities detected in the purchase of material in the Shimla Mechanical Division-II. “The report from the commissioner (departmental inquiry) is still awaited and I assure that action be will be taken against all those found guilty,” he said. He said some of the employees and officials concerned had even been suspended and chargesheeted and the Vigilance Bureau had taken all documents into its possession. Mohinder Singh said action should also be initiated against the contractors involved in the work and the matter should be expedited as the inquiry had been going for the past three years. In reply to a question about setting up of thermal power plant in the state, Dhumal said there was no such proposal. “However, to meet power shortage during winters, the state has a banking system with Punjab, where surplus power is given to each other during lean generation months,” he added. The Himachal Pradesh Cabinet today approved signing of the Pre-Implementation Agreement (PIA) in respect of Chango-Yangthang (140-MW) and Bara Banghal (200-MW) hydro electric projects for execution by private entrepreneurs. It also decided to advertise the 60-MW Ropa Hydro Electric Project under ‘competitive open bidding’ system to attract best companies to undertake the execution work of the project expeditiously. Chief Minister Prem Kumar Dhumal presided over the meeting which approved amendment to Section 5 sub-section (1) of the Himachal Pradesh Scheduled Castes and Scheduled Tribes Development Corporation Act, 1979 (Act 20 of 1979), and authorised increase in its capital to Rs 60 crore with a view to providing liberal financial help to the Scheduled Caste and Scheduled Tribe community for setting up their own self employment ventures under different schemes of the government. It approved creation of one post of conservator of forests in the State Electricity Board to be placed at the disposal of the State Power Corporation, 29 supernumerary posts for filling up of the backlog meant for persons with disability in the Urban Development Department as per the guidelines of the administrative department, 200 posts of assistant librarian in the Department of Higher Education, 147 posts of various categories for Government Polytechnics at Sundernagar, Kangra, Hamirpur, Ambota, Rohru and Kandaghat to cater to the increased number of vocational courses and higher admissions; 7 posts of Election Kanungo in the State Election Department. It decided to release the salary of 50 part time water carriers of Lahaul-Spiti district as grant-in-aid through the respective gram panchayats to whom no payment had been made since 2003 and impose a penalty of Rs 2,000 over each of the three delinquent officers. It approved amendment to the Recruitment and Promotion Rules of the Tehsil Welfare Officer (Class-II) Non-Gazetted on 50 per cent by promotion and 50 per cent by direct recruitment. It decided to take over the privately managed Indira Gandhi High School, Shehrol, in Arki subdivision of Solan. While the state government maintains that the policy of allotting hydroelectric projects on the basis of upfront premium was the best option, a comparison with the bidding process adopted by other states indicates that it has been a losing proposition. Even a country like Nepal, which does not have any expertise in the hydropower sector, has struck a much better deal while assigning the 402-MW Arun-III project to the Sutlej Jal Vidyut Nigam (SJVN) by securing 22 per cent free power. Competitive bidding on the basis of upfront premium appears to be an attractive proposition as the government receives the money even before the start of work on the project. However, an in-depth analysis clearly reveals that the two other modes, tariff-based bidding and free power-based bidding, are economically far more rewarding options. The seven projects with aggregate generation capacity of 1,848-MW awarded through international bidding route fetched a one-time upfront premium of Rs 862 crore. In comparison, if a project like the 1500-MW Nathpa-Jhakri Project, which generates more than 6,000 million units annually, is allotted on tariff-based bidding, it will bring in much more money in a single year after commissioning. The generation cost comes to under Rs 3 per unit and the average sale price ranges from Rs 5.50 to Rs 6 per unit these days. As such, the state would earn a minimum profit of Rs 2.50 per unit by selling the power generated from the project. The total profit would be Rs 1,500 crore in the very first year and the amount would increase in every subsequent year with the hike in rates of power. Similarly, the option of free power-based bidding is also at a better proposition as evident from the project bagged by the SJVN in Nepal recently. The company was second placed on the basis of international bidding, but got the project as the top bidder had already been awarded anther project. The SJVN agreed to give 21.9 per cent free power to the Nepal government, which is almost 10 per cent more than the 12 per cent free power the state government gets in all projects. The additional 10 per cent free power in a 1,500-MW project like Nathpa-Jhakri will make 600 million units which will fetch Rs 350 crore every year at current market rates, which are bound to go up further. Private companies are ready to give 30 per cent power or even more free of cost to secure projects in the state, which means that a 1500-MW project will fetch more than Rs 500 crore annually which is far more lucrative proposition than taking one-time upfront premium of Rs 700 crore. The new BJP government has taken a laudable decision to allot all projects with a generation capacity of 5 MW or more through competitive bidding. To take full advantage of the decision, it is imperative to review the policy of awarding projects on the basis of upfront premium and adopt the more rewarding options. In a statement issued here today he said the media reports were not based on facts and presented a garbled and exaggerated version of what actually happened. He categorically stated there was no rift in the party and it was united under the leadership of Sonia Gandhi. He said a two-party system, with the Congress and the BJP occupying the centrestage, had come to stay in the state and a general impression was being created that the people voted these parities to power by rotation. It was being said that as the BJP was in office, the Congress would automatically come to power next time. However, he did not agree with this view and strongly felt that this feeling was wrong. The Congress could come to power only by hard work and struggle. This was relevant in the past and even now. Referring to the lunch hosted by former minister Chandresh Kumari he said the matter had been blown out of proportion. As the rally was being held in her constituency, she had arranged lunch for party workers to which he was also invited. When he accepted the invitation he was not aware of any other arrangement made for lunch for a select few. Making an issue out of this trivial matter was most unfortunate and uncalled for. This is how two Australian tourists, Esther O’brien and Wade Collins, who travelled through Tibet from February 26 to March 5, described the situation in the troubled land. Talking about the Dalai Lama or the Tibetan issue was a sin which attracted a fine of $ 1,000 and imprisonment. Interacting with the media under the aegis of the local Tibetan Solidarity Committee they said the Tibetans were a harassed lot and they had lost out to the Chinese to such an extent that many of them could be seen “begging” on the streets. The lineage of the Dalai Lama at the Potala Palace in Lhasa ended with the 13th Dalai Lama. There was no mention of the 14th Dalai Lama. The Tibetan language had all but completely been wiped out as evident from the fact that all signages and hoardings were in Chinese language. Only Chinese TV programmes were being shown and there were long programmes helping viewers to learn the Chinese language. Heavy road construction activity was going on right from the Nepal border for the first 150 km and thereafter already existed a highway 150 km in length. Many factories and power lines had been set up between Nepal and Lhasa. Vice-president of the solidarity committee Ngwang Yonten said the Chinese were working overtime to wipe out the name of the Dalai Lama from Tibet and they were discriminating again Tibetans to weaken them economically so that they were forced to surrender before the Chinese government. With no employment opportunities Tibetan youths were passing time by consuming alcohol which was a matter of serious concern. The Chinese had deliberately made alcohol very cheap to achieve their nefarious end of destroying the young Tibetan generation. A huge number of Chinese people had been transferred to Tibet to reduce the Tibetans to a minority in their own homeland. Spokesman of the Tibetan government in exile in a statement here today said the state controlled mouth piece of the Communist Party of China Xinhua News Agency ran a story yesterday on the involvement of the Tibetan government in exile and the Dalai Lama in recent demonstrations in Lhasa and other parts of Tibet. He said the article which was purportedly written by Yedhoo accused the Dalai Lama and Tibetan government in exile. The charges were concocted and premeditated with no inkling of truth in it. Since the beginning of the incident China had blamed the Dalai Lama and the CTA without any conclusive proof and this article was the same. Courtesy, the state government and the ongoing tug-of-war between a local MLA and a BJP leader over posting of their own choice of anaesthetist here at the cost of patients’ convenience. Though the issue was brought to the notice of Chief Minister Prem Kumar Dhumal, when he inaugurated the new OPD complex of the hospital on February 15, yet nothing had been done by the state government in this pretext. In the absence of a permanent anaesthetist, operation theatres and surgical equipment have gathered dust thus causing huge loss to the state exchequer. Moreover, the patients, who were suggested major surgeries, were forced to shift out of the state for treatment. Catering to over eight Assembly constituencies of Kangra district, the hospital is located on the Amritsar-Pathankot-Kullu highway and had been functioning with inadequate staff strength of 50 against the sanctioned strength of 104. Being on the inter-state highway, four to five major accidental causalities are registered here daily. Non-existence of a trauma centre further puts the critical patients to a great hardship. HPCC general secretary Ajay Mahajan claimed that a fight for pride between a local MLA and a BJP leader has virtually added to pains of the poor patients. The research done by Dr Bhavnesh Devkaran from the Department of Surgery at the Indira Gandhi Medical College (IGMC) over a period of last six years has proved that angiopathy or by-pass surgery could be better options in treating a diabetic foot. 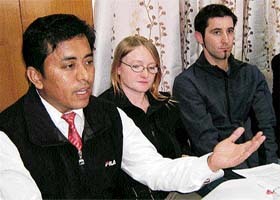 Dr S.S. Manhas was the guide and Dr Rajeev Bhardwaj was the co-guide for the study. Dr Bhavnesh was in fact given the best paper award for his work “Macroangiopathy in Diabetic Foot” at the recently concluded “Diabetic Foot-Global Conference” held at Los Angeles from March 13 to 15. Only two doctors from India had attended the conference. “During my research I evaluated over 50 patients who had developed ulcers and wound in their feet due to diabetes, with some of them going through trauma of amputation,” Dr Bhavnesh said. Diabetic foot is a major problem faced by acute diabetes patients worldwide but as compared to the developing world, the management of the problem is far better in the developed countries. “The reported incidence of diabetic foot in developing countries like India varies between 2 to 29 per cent whereas in developed nations like the US it ranges between 12 to 15 per cent,” he said. More importantly, the incidence of amputation in diabetic foot is as high as 35 per cent. He said the new research will ensure that the blood supply to the feet is restored by opening up the vessel, leading to fast healing. In other cases of neuropathy, the patient cannot feel sensation in feet even in case of injury due to the nerves getting damaged and macroangiopathy can be very helpful in this case. “The diabetic patients in Himachal need to be more careful with regard to diabetic foot as due to difficult terrain chances of injury are higher,” he said. Inquiries revealed that there was little hope for wheat crop in Banasar, Chammu, Pratha, Bhojnanagar, Taksaal and Narayani panchayats falling under Dharampur block, besides areas under Kabakalan and Neri Kalan panchayats. Scanty rainfall from November onwards had proved fatal for the crop. The farmers had gone for late sowing of the crop in November-end hoping for some good results in the coming period. However, things started to show negative signs in December when poor rainfall was witnessed. The extreme dry cold conditions accompanied by frost in January had further eclipsed the hope. This was the first time that such conditions were witnessed, rued farmers. The other parts of the region had experienced good rainfall in the winter but the rainfall in this area was not sufficient for the growth of crop, they lamented. A constitutional crisis has arisen in the local Baghat Urban Co-operative Bank here with the government de-notifying the two nominated members from the Board of Directors (BoD). It has reduced it to a mere strength of three. While the two nominated members Shammi Sahni and Bhupender Kashyap have been de-notified, the three remaining directors, including chairman Arun Sharma, vice-chairman Sardar Singh Thakur and Vijay Kumar Attri have reduced the BoD into a minority. The bank had seven members in the BoD along with the chairman and vice-chairman, when it was constituted in October, 2000. They were elected for a term of five years, which expired in 2005. The previous Congress government granted two yearly extensions to it and a fresh eight-month extension was granted to it in December just before the expiry of the term of the previous Congress government. Its two BoD members, who were nominated by the previous BJP government, had resigned in 2003, following the ouster of the then BJP government, while two others had been removed in 2004. These members included Subhash Jethi, Prem Jaswal, Bhupinder Thakur and Pawan Gupta. These vacancies were never filled and the bank continued to run with three nominees only. Now with the BoD comprising merely chairman, vice-chairman and a lone member, Vijay Attri, the board had been reduced to a constitutionally weak position. The BoD are chosen by the respective political parties when in power. Usually the BoD members quit after the change of government. But despite the Congress being routed in the polls, its nominees, including the chairman and vice-chairman, continue to occupy the posts. This has become a point of contention among the BJP aspirants, who are now lobbying for the coveted posts. It was pressure posed by this lobby, which had led to the de-notification of the two members. It remains to be seen how the crisis is settled as with barely three members no major decision, including the holding of any meeting, can be taken . While this will make the working of the bank suffer, it is yet to be seen whether the Congress- supported members vacate the posts on their own or wait for the expiry of their term in August. A delegation of the Himachal Pradesh Hali Vikas Maha Sangh called on him under the leadership of Speaker Tulsi Ram today. The CM assured the delegation that the government was committed to protect interests of the minorities and weaker sections of society and programmes formulated for their welfare would be properly implemented. A number of welfare boards for different sections of society had been set up to advise the government regarding measures required for the betterment of specific communities. The government had been accepting the recommendations made by such boards after taking all related aspects into consideration. He said the government had made separate provisions for development requirements of backward sections of society. It recently enhanced the allocation under the Scheduled Caste Special Component Plan from the existing 11 per cent to 25 per cent and earmarked 157 per cent more funds for 2008-09 as compared to 2007-08. He assured the sangh that all their demands would be examined and considered sympathetically. Ramesh Dogra, president of the association, has threatened to start a mass indefinite strike if the government does not agree to their demands by March 31. He claimed the five teachers, currently in the Tanda medical college hospital, have been on an indefinite fast since March 27. Dogra has blamed director of education O.P. Sharma for their present plight as he is still praising the computer company imparting IT education instead of severing the pact with it. He has asked the department to release their salaries immediately. Details of the calls made from the mobile phone found from the nearby forest helped the police in identifying the two youths found murdered yesterday. While one was Rajeev, a member of the Setu gang of Kathua, the other was suspected to be Deepu, another gang member from Jammu. “Rajeev, whose father died only a month back, has a number of cases registered against him at Kathua,” said district police chief R.M. Sharma. It was after getting the number of Rajeev’s brother, Suresh, a police constable posted at Srinagar, that the police was able to get information that helped in identifying the body. According to the brother of the deceased, Rajeev was a member of the Bakra gang earlier, which was now headed by Setu for whom he had been working for the past two years. Sources said the brother of the deceased was not even willing to take his body and was learnt to have told the police to cremate it. “We will wait for two days after which we will cremate the body,” said Sharma. The police had found some clothes, two mobile phones and Rs 300 from the forest that was about 2 km away from the site where the bodies were found. The police also found an identity card in the name of Rajeev issued by the Ministry of Home Affairs. Efforts were on to verify if it was a genuine card. A police team will leave for Kathua and Jammu tomorrow to get more details from the family members of the deceased. Solan SP S.P.S.Verma said nakas were put up all over the Parwanoo subdivision on Saturday night. Questioning a motorcycle rider and his pillion at Dharampur naka raised some suspicion. During questioning, the duo, Sumit and Dharamvir, were seen watching six youths riding three other motorcycles. The youths, however, fled the spot on seeing the police leaving behind their bikes. The bikes were impounded a hunt was launched to arrest them. It was found that all those bikes (HP-15-6536, HP-15-6109, HP-15-6339 and HP-15-0527) were lifted from the Kasauli-Garkhal area. The accused were arrested from the Parwanoo barrier while travelling in a bus that they had boarded from Jabli. Parwanoo DSP Ramesh Pathania said all seven had furnished incorrect information about their whereabouts and none belonged to Mauli Jagran village, near Chandigarh, as claimed by them. Preliminary investigation revealed that they basically targeted shops along the Kalka-Shimla highway from Parwanoo to Dharampur. These bikes were stolen by them as a mode of transportation. Teams would be sent to Chandigarh tomorrow to get more information about the accused. Cases of theft were pending against two of them. The same gang had also broken the locks of some shop at Garkhal last year. However, the amount stolen was small and the theft were never reported. Addressing mediapersons here yesterday, association state president Sukumar Singh said this decision has been taken by the IOL without taking the state government into confidence and without considering its wider implications for the state petroleum dealers and consumers. Singh, who was accompanied by a number of other association leaders, said this step was ill-advised as it would result in an annual loss of Rs 4 crore to the corporation apart from depriving state dealers from the facility of sales tax being charged at the first stage. He also said this new system is bound to increase petroleum prices by Rs 1.50 and diesel prices by Rs 1 per litre, further resulting in reduction of sales in the state putting them and the government in great revenue loss. He said the matter may not end here alone as next year even Parwanoo depot of these products may be decided to be closed in the similar way and this would further cause loss of some Rs 15 to 20 crore to the oil corporation and companies. He demanded immediate intervention of the state government into this matter and continuation of the present system of depots at Damtal and Parwaoo for petroleum supplies to the entire state. Bali said the 10-member state election committee headed by Moti Lal Vohra had detailed discussions about the selected candidates and 95 per cent of them were chosen with consensus while the rest, including Rampur and Arki, were selected with the intervention of the party high Command. He said Virbhadra Singh was duly consulted on ticket distribution. The state government effected a minor administrative reshuffle today. Bhuvneshveri Vohra, AC (leave reserve) to DC, Chamba, has been given the additional charge of AC to DC, Chamba. Rakesh Kapoor, AC (leave reserve) to DC, Shimla, has been given the additional charge of AC to DC, Bilaspur. He directed corporation officials to maintain cleanliness in the shops, besides ensuring proper storage of medicines. He said the corporation was operating medicine shops at various places to help provide medicines to the people at reasonable rates round the clock. He appealed to the doctors to prescribe those medicines, which were available in these shops. General manager of the corporation S.K. Acharya and drug controller R.K. Chaudhary, also accompanied him. Tourists, who used to opt for Delhi-Pathankot air route for visiting tourist spots in Chamba district, now have to land at the Gaggal airport in Kangra district, which is far away from Chamba district. The daily flights were started 15 months ago by the company when the Indian Air force (IAF) station at Pathankot was thrown open for civil aviation. Air Deccan used to pay to the IAF for using the airport. The civil airport built a few years ago by the Union Civil Aviation Department near the IAF station is being used for parking of aircrafts and boarding of passengers only. The Delhi-Pathankot daily flight was considered a big boost for tourism in both states. Moreover, it was also beneficial for entrepreneurs setting up their units in Nurpur. Ravinder Salaria, manager of Air Deccan, said the company had terminated its Pathankot-Delhi daily service due to low revenue generation. The police is trying to establish the facts about his death whether it was a suicide or any other suspicious act of killing. Kangra district police chief Dr Atul Phulgaly said a student of B.A final, who was putting up in the Depot Bazar locality of Dharamsala along with his sister and father Drobh Singh, died under mysterious circumstances. According to the preliminary investigations, Sunny had hanged himself in his room with a bed sheet. A girl, who is said to be a friend of his sister, has cut the bed sheet and laid Sunny down. The father of the deceased youth and his sister rushed him to the Zonal Hospital. The body has been sent for a post-mortem examination. Two persons died in two separate accidents both were riding the bikes and collided with trucks. Cases have been registered against the drivers and vehicles impounded. The first accident occurred yesterday night near Kanaid at 9 pm when a speeding truck (HP-31A-0234) collided with the bike. The person killed in the accident was identified as Parvez, a resident of Dugrain. In the second accident a truck (HP-24B-1292) and a motorbike collided at Kanaid Chowk today morning injuring Dumnu Ram (35), a resident of Rakar village, who later succumbed to injuries. Three youths were killed when their car rolled into a khad near the Housing Board Colony at Panthaghatti last night. The mishap took place around 10 p.m when Indica car (HP-01-0394) fell into the khad.. The three occupants of the car, Ankush (21) of Kotkhai, Pankaj Mehra (20) of Maili and Manoj Sharma (20) of Kotkhai, were killed in the accident. While two youths died on the spot, the third died today at Indira Gandhi Medical College (IGMC), where he was under treatment. A fine of Rs 20,000 was also imposed on them. In case of default in payment of fine, they would have to undergo rigorous imprisonment for additional one year. The accused were reportedly debarred from inheriting the property of their father. This often led to quarrel between the father and his sons. On the intervening night of August 12 and 13, 2006, they murdered their parents and burnt their bodies in a log hut near their house. The HP State Electricity Board (HPSEB) employees staged dharna in protest against the proposed trifurcation of the board here today. They were demanding immediate scraping of the trifurcation proposal. The experiment had already failed to deliver the goods in many states, they claimed. Employee leaders said the Central Government should withdraw the proposal of trifurcation of the board as it would harm the interests of the state and the employees. “The trifurcation of the power boards in many states has proved counter-productive, landing the boards in crisis,” they said.